The Andhra Pradesh State Level Police Recruitment Board has recently released an official notification regarding the recruitment of 2,485 drivers. The notification was released on the official website of the AP Police - appolice.gov.in and in a print advertisement. The candidates who are willing to apply for the post of AP Police Driver can visit the official website to apply. However, the board has not yet announced the starting date and the last date for AP Police Driver Recruitment 2018. How to Apply for Andhra Pradesh Police Driver Recruitment 2018? As soon as when AP Police Officials release online registration dates, candidates must apply at AP Police Official Site. However, while filling of AP Police Online Application Form, candidates are requested to follow the below procedure. Firstly, visit the official site – www.appolice.gov.in of Andhra Pradesh State Police Department. Search for AP Police Driver Notification 2018 on its homepage. Read all the details mentioned in an advertisement of AP Police Driver Recruitment 2018. Check your ability and apply only if you fit in the AP Police Driver Eligibility Criteria. 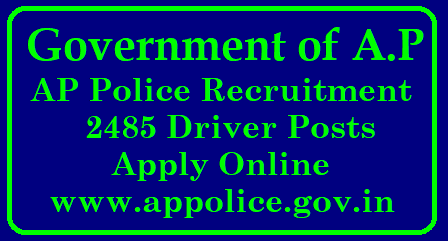 If willing to apply, click on AP Police Driver Apply Online Link. Fill all the details in a correct way as specified in an application form. Re-check all the filled details and click on Submit button. Before submitting an application form make sure that you upload all the required scanned documents, photographs and make a payment of online form fees. Finally, take a printout of online filled form for further use.